This is a slow structure. I built the framing two summers ago. Because I can be a bit of a purist about some things I used Japanese joinery and traditional Japanese hand tools for most of it. Its like a big puzzle. The framing has no hardware (except a few "invisible" repairs). I'm also a penny pincher in some respects and I used cheap lumber, namely treated pine. My joinery was fairly accurate, but the bargain wood twisted, warped, and cracked. Stupid. Last summer I built the floor. This was made with cedar and lots of hardware. I also started to landscape last summer. My wife, Jennifer, and I have been focused on Japanese aesthetics recently and this building has become a hub for implementing our ideas. This summer I built the trellis you see in the background, added the bamboo fence, and put a roof on the structure. Two years ago this structure was only meant to have vines climb on it. This year the gnats were seriously threatening our sanity and we decided to screen the structure in. (Notice I don't know what to call it? Just as it's purpose and structure has changed, so have its names. 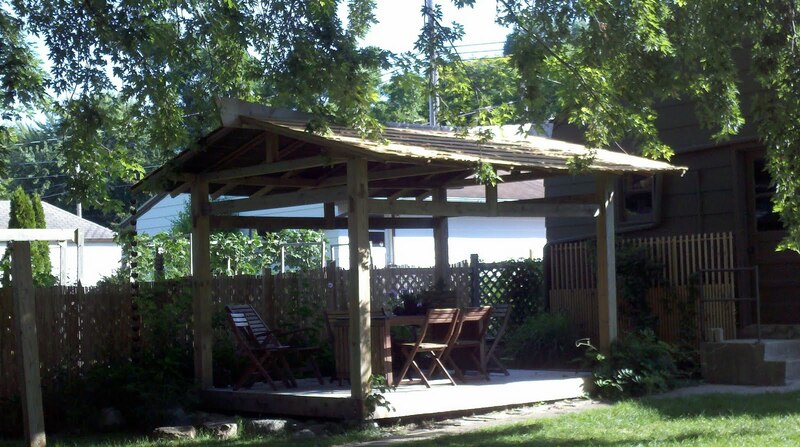 It's been called The Arbor, The Deck, The Chunky Pig, The Red Thread, and others call it a pagoda. Some day we may just call it the screen house but we're not ready to settle on anything yet.) 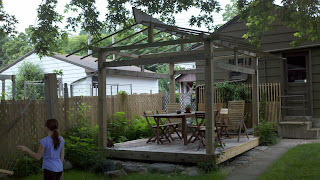 A screen house needs a roof so I made the necessary reinforcements and laid on cedar plywood. We had hoped to use cedar shakes but nearly gagged at the cost. I'm pleased that after 3 years of changing our minds the structure still has a cohesive feel. I'm surprised at how much more solid it looks with the roof. Somehow that one element has made the whole thing feel more welcoming. Unfortunately we have to wait a few years before it gets a good batch of moss on the roof.